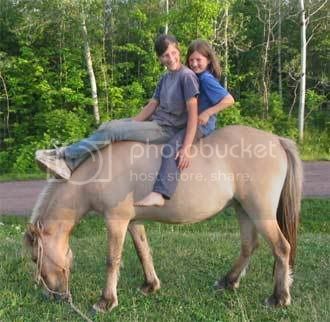 It was such a sight to see: the pony cantering by and the two girls riding the rocky stride with good seats. I was surprised and impressed. The older had a smile that stretched from ear to ear as she directed the pony's movements. The younger simply laughed. A deep, natural, loud belly laugh that said it all. Because she had the back seat and her feet only made it to just past the older girl's knees, she had to hold tightly to her older sister's waist to keep her balance. The pony herself seemed rather cautious, but at the older girl's reassuring urging, she again stretched her legs and cantered the remaining length of the pasture in under 10 seconds, her thick, long and 3 colored mane billowed back into the girls like something out of a fairy tale book. She seemed to derive her playful, happy strong, energy from the girls' constant giggles. It was obviously morning, as the sun was still doing its morning stretches across the pasture. When I moseyed back to the gate, they had watered their pony and the younger one had leapt off to open the gate. I came up just in time to see their 'secret' mounting method: the older girl stiffened her foot and the younger one stepped on it, gripping her older sister's hand, she swung surprisingly easily up onto the pony's back behind her sister. Both burst into giggles as the pony started off in a jolt in search of some green grass and they momentarily lost their seats. I was relaxing in the shade of the apple tree by my flower pot when they decided to go for a walk down the road. Their smiles disappeared down the hill, but their giggles still rang in my ears and followed me to the house until the door closed behind me. The moment stuck with me all day and left me with a feeling of contented happiness. That is such a vivid description, I could see it perfectly! So send comment of send one of those messages with your address and then tell me when you get it!! !